It’s been almost 18 months since the grand opening of the HPE’s Americas IoT Innovation Lab in Houston, Texas. This center, along with its sister APJ facility in Singapore and two new online labs in Geneva and Bangalore, serve as collaborative environments where customers, HPE, and partners can develop, test, and assist in the deployment of advanced IoT and edge solutions. Collaborative innovation is at the heart of what takes place at these IoT Innovation Labs, with the ultimate goal of invention and innovative products and solutions that deliver material business outcomes. In the post below, I am going to give an overview of how the collaborative process works and describe some of the unique features of the IoT Innovation Labs. The edge, by definition, is anything that’s not a data center or cloud. The edge could be an assembly line, a windfarm, a submarine, a smart car, a smart city, a power plant, a smart grid, an industrial oil refinery, a home, or hospital. These are often harsh environments and require specialized equipment. Operational technologies (OT), such as control systems, data acquisition systems, and industrial networks reside at the edge. And, more and more enterprise-class IT systems (compute, storage, systems management) are moving out to the edge. These two worlds, OT and IT, are comingling and converging at the edge, and has prompted the creation of a new class of systems and solutions to efficiently command the edge and IoT. Specifically, we’re bridging this IT-OT divide with physical OT-IT convergence, combining both in single system box, we call Edgeline Converged Edge Systems. Visitors to one of HPE’s IoT Innovation Labs can see various technology solutions, from the edge to the cloud. But to get a better understanding of how things actually work on the edge, engaging with our Edge Experience Zones (EEZ) is instructive and enlightening. The EEZs emulate the reality of being out on the edge, whether it’s a factory floor, city street, or hospital room. 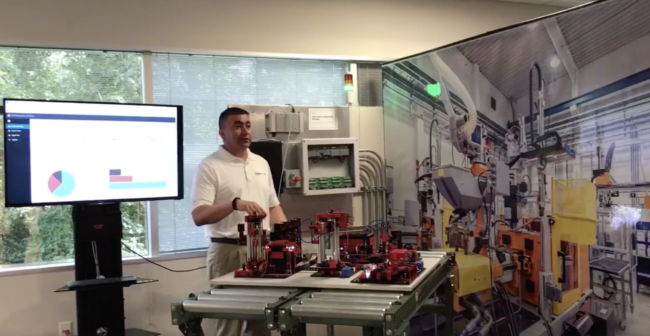 For instance, the manufacturing floor EEZ is a physical location within the Lab, where there are demonstrations of how the industrial IoT advances manufacturing processes. The zone for smart cities has smart parking lots and a system that closes down roads automatically if a flood takes place. And the smart hospital experience zone includes a hospital room with healthcare equipment used to monitor patients and optimize health outcomes. What’s profound about the Edge Experience Zones and the other parts of HPE’s IoT Innovation Labs is that they are not only places to demonstrate or test solutions. Rather, they are places to get people thinking about possibilities, and come together to ideate on the next generation of IoT and Intelligent Edge solutions. For HPE and its IoT ecosystem of partners (ABB, PTC, National Instruments, Schneider Electric, GE Digital, Deloitte, Intel, SparkCognition, Microsoft and many others), it’s an opportunity to listen to what customers have to say.